Don’t give up on the Nationals. I know that sounds nuts, considering that the Nats have lost six straight and 17 of 24, falling 4½ games behind the Mets in the NL East. But things are bound to get better, if only because they cannot get worse. The Nationals’ problem is not their manager, though Matt Williams certainly has made strategic blunders. Nor is it the Jonathan Papelbon trade, though the deal certainly upset the team’s displaced closer, Drew Storen. No, the problem simply is that the Nationals are playing poorly, flopping nightly in one or more phases of the game. It won’t continue. It can’t continue. 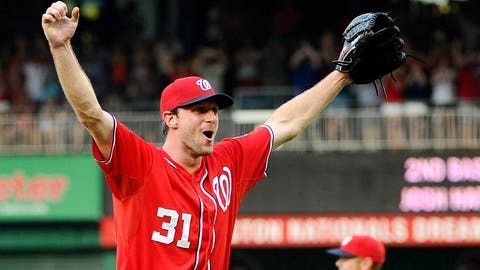 The Nats’ schedule is about to ease considerably – the team begins a three-game series in Colorado on Tuesday night, then returns home for a nine-game stand against the Brewers, Padres and Marlins. A soft schedule means little when a team cannot get out of its own way. It might mean even less for the Nats, considering that the Mets’ remaining schedule also is weak. But right around this time last season, the Nationals won 10 straight. Does anyone doubt they are capable of doing it again? I know, I know – we’ve expected more all season, expected more, really, for the last four seasons. The Nats have yet to win a playoff series, much less the World Series. But I’m sorry, they are not a dysfunctional mess like the Red Sox were in the first half. Three recently injured hitters – Anthony Rendon, Ryan Zimmerman and Jayson Werth – are still in varying degrees of spring-training mode. A fourth, Denard Span, began a rehabilitation assignment on Sunday; the Nats are 35-24 when he is in the lineup, 23-34 when he is not. At some point, the hitting must improve, and the pitching along with it – the Nats’ ERA in August is 5.23, an inexplicable number even in a relatively small sample for a staff this strong. But 45 games remain, including six with the Mets. It’s baseball. Things change quickly. Don’t give up on the Nats just yet. Firing a manager this late in the season is not unprecedented; heck, the Brewers dumped Ned Yost with just 12 games left in 2008. Williams does not appear in jeopardy, not after winning 96 games and the NL Manager of the Year award as a rookie skipper in 2014. But check back at the end of the season. Nationals GM Mike Rizzo, who handpicked Williams to replace Davey Johnson, might need to reconsider his loyalty to the manager if the Nats fail to make the playoffs. Numerous sources say that Nats ownership is unhappy – not a shock, considering the team’s Opening Day payroll was a club-record $162 million. The Nats’ ownership structure includes many chiefs – Ted Lerner is the managing principal owner, while his wife, three children and their spouses are all listed as principal owners. The team has not had a club president since Stan Kasten left after the 2010 season (though Rizzo is president of baseball operations). Given the structure – and the involvement of the principal owners – a team president is superfluous. So, for all the speculation about free-agent executive Dave Dombrowski joining the Nats, the idea does not appear to make sense. Dombrowski, who doubled as Tigers’ president and GM, would have a lesser title in Washington than he did in Detroit. He also would have less authority – the Nats’ free-agent signings occasionally are driven by ownership, not the GM. Heck, the only way ownership could even justify a change in GMs would be if its relationship with Rizzo soured. Rizzo is headstrong, “a hard guy to manage,” in the words of one baseball official. But he also has proven to be a shrewd and highly capable executive. In fact, it would not be a surprise if another club tried to pry away Rizzo, who is signed to a contract of unspecified length. The Angels, who are operating under interim GM Bill Stoneman, would be a particularly intriguing possibility. Scioscia and Rizzo would seem to be a good fit philosophically, but one source with knowledge of the Angels’ thinking said he would be “shocked” if the team pursued such a union, which likely would require compensation to the Nationals. The source believes the team is more likely to elevate assistant GM Matt Klentak or hire Yankees assistant GM Billy Eppler, who was a finalist for the job that went to Jerry Dipoto in 2011. The Mariners have not made a decision on whether to retain GM Jack Zduriencik, but sources say they are in the “contemplation phase,” pondering whether to make such a move. *Would the M’s or any other club grant Dombrowski a percentage of ownership, similar to what Billy Beane has with Oakland? “I bet that is his next step – go somewhere where he can have an ownership stake,” one rival official says. Some rival executives question whether the Mariners would hire Dombrowski, saying that the team does not pay top dollar for its front-office hires. *What would a Dombrowski hiring by the Mariners mean for manager Lloyd McClendon, whom Dombrowski bypassed for Brad Ausmus as Jim Leyland’s replacement in Detroit? At the time, McClendon was the Tigers’ hitting coach. One of the underplayed aspects of the Cole Hamels trade was the Phillies’ willingness to take back oft-injured left-hander Matt Harrison, who was owed more than $32 million through 2017. The Phillies, though, didn’t simply inherit Harrison’s contract – they also inherited the insurance policy attached to his deal. The policy entitles the Phils to 75 percent of Harrison’s salary past a certain cutoff, but only if the insurance company confirms that he is unable to perform due to a specific back issue, according to a source with knowledge of the situation. Harrison, who will turn 30 on Sept. 16, has made only nine starts since 2013, including three after he returned from back surgery in early July. He was scheduled to pitch for the Rangers again on Aug. 1, but the Phillies put him back on the disabled list immediately after the trade. The Phillies could be in line to collect insurance on Harrison even though the Rangers had activated him – Harrison’s return to the DL occurred within a 45-day recurrence period, according to the source. Still, it is not clear whether the insurance company will honor the claim, considering that Harrison had resumed pitching. In any case, the Phillies’ savings – if any – will go only so far. Even if they collect insurance on Harrison, they will need to redirect at least some of the money to another veteran pitcher or two. The team’s projected 2016 rotation lacks anything close to an established starter. *The Royals inquired about David Price before turning serious on Johnny Cueto, but at the time – almost a week before the non-waiver deadline – Price was unavailable. Cueto was a top target from the beginning; the Royals entered the season expecting they would need to make a deadline deal for a starting pitcher. Royals GM Dayton Moore describes the Royals as a high-energy team – they play fast, they’re aggressive in everything they do. Such a club needs pitchers who are athletic, who compete, who throw strikes. *Ben Zobrist was working at second base on Friday with infield coach Mike Jirschele, explaining that his footwork on the pivot is unconventional. Zobrist’s defensive fundamentals aren’t by the book, but his work ethic is impeccable and he handles himself well at virtually every position. He made his first start at third since 2010 on Aug. 9, taking a hundred or so grounders at the position before the game. *Moore told a great story about how the team’s bullpen has spoiled everyone who watches the club – even his wife, Marianne. Holland was back to his normal self Friday night, striking out the side to preserve the Royals’ 4-1 victory. The Astros’ offense is undeniably streaky, but the loss of right fielder George Springer has had an impact. The Astros, after averaging 4.59 runs in their first 81 games, have fallen to 4.08 since Springer fractured his right wrist on July 1 – a drop-off of more than a half-run per game. The absence of one player alone does not account for such a difference, but consider what the Astros’ lineup might look like after Springer returns – hopefully in the first week of September, hopefully at full strength. Lowrie obviously is not a traditional cleanup man, but as a switch-hitter he could break up the right-handed hitters at the top of the lineup. Valbuena, who has 21 homers, would be in the eighth spot – not bad. The Astros will get an additional boost when right-hander Vince Velasquez returns after rosters expand on Sept. 1 – Velasquez, now working as a reliever at Double-A, would add needed velocity to the bullpen. The AL West race is getting more interesting by the day – the Rangers are now just a half-game behind the Angels and three behind the Astros, with seven games remaining against both teams. SPEAKING OF THE ANGELS . . .
David Murphy is 8 for 22 with two homers in his last six games, but it’s certainly fair to ask whether the Angels added enough offense at the non-waiver deadline – they’re last in the majors in runs per game in August. That is not all the doing of Murphy and the team’s other late-July acquisitions – Shane Victorino, David DeJesus and Conor Gillaspie. Mike Trout’s OPS in August is .571, while Albert Pujols’ is .642. David Freese remains on the DL, and Erick Aybar recently missed three games due to back trouble. Still, the Angels could use another left-handed bat – Chase Utley perhaps, or even better, a younger slugger such as the Rockies’ Carlos Gonzalez. The Angels were in on all the big-name hitters in July, but as it turned out, Gonzalez and Jay Bruce weren’t traded and the prices on Yoenis Cespedes and Ben Zobrist proved rather steep. Several days before the deadline, the Angels had to make a call – do they wait for the bigger names and possibly overpay, or jump on the more modest but available upgrades? They chose the latter route, giving up little in return. Club officials felt it was important to hold on to their young pitching, recalling that they lost left-hander Tyler Skaggs and righty Garrett Richards to season-ending injuries around this time a year ago. Fair enough, but the team has gone from a two-game lead in the AL West on July 22 to a 2½-game deficit, and is now a half-game behind the Orioles in the wild-card race. *Eight of the Dodgers’ remaining 44 games are in AL parks, creating DH opportunities for Utley if the team acquires him in a trade. 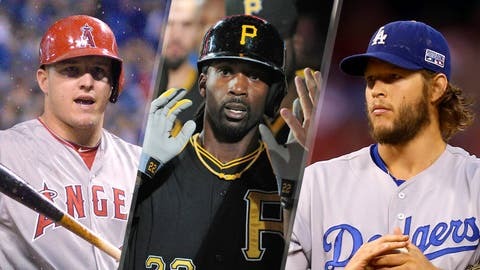 The first five of those games, however, begin Tuesday night in Oakland, so the opportunity to use Utley in such a capacity will fade if a deal is not completed soon. Seven weeks of Utley probably will not bring the Phillies a significant return, but his value falls incrementally with each passing day. The Giants, by the way, have three games remaining in AL parks – Sept. 25 to 27 in Oakland. *Is there something in the air in Chicago? According to park factor, which compares the rate of stats at home with the rate of stats on the road, U.S. Cellular Field is the second-most difficult hitter’s park this season, while Wrigley is tied with Safeco Field as the fourth most difficult. Park factor can fluctuate considerably from season to season – Wrigley was the seventh-most difficult for hitters in 2014, but the second easiest in ’13. U.S. Cellular, though, has been consistently favorable to offense — the eighth-easiest hitter’s park, on average, the previous five seasons. 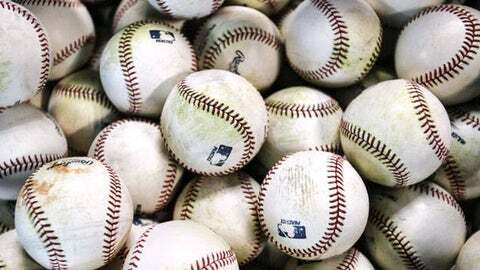 *Something I frequently hear from executives: The pool of potential managers is small, in part because baseball does a poor job of developing candidates. Minor-league managers “get paid nothing,” according to one GM, discouraging former players from training at that level (former Phillies manager Ryne Sandberg was an exception). As I’ve written, a large number of managing jobs could open at the end of the season. *Rookie shortstop Francisco Lindor and third baseman Giovanny Urshela have been with the Indians for barely more than two months, but both have made a significant impact defensively. Defensive metrics are not entirely trustworthy, but it’s telling that Lindor ranks sixth in the majors at short in defensive runs saved despite spending April, May and part of June in the minors, while Urshela ranks 14th at third. Lindor, the more highly regarded prospect, has been the better offensive performer, improving his OPS from .539 in June to .772 in July to .825 in August. *If Marlins second baseman Dee Gordon and shortstop Adeiny Hechavarria both win Gold Gloves, it will be the first time since 2010 (Robinson Cano and Derek Jeter of the Yankees) that a double-play combination from the same team was honored in such fashion and first time since 2002 (Fernando Vina and Edgar Renteria of the Cardinals) in the NL. Gordon faces the easier path – the Diamondbacks’ Chris Owings and Nationals’ Danny Espinosa are his main competition. Hechavarria, on the other hand, must overcome the Giants’ Brandon Crawford, Braves’ Andrelton Simmons and Diamondbacks’ Nick Ahmed. Gold Glove voting consists of two components – 75 percent from a vote by managers and coaches, 25 percent from advanced statistical data. *One reason the Royals signed Joba Chamberlain to a minor-league contract: Chamberlain’s previous relationship with pitching coach Dave Eiland, who helped develop the right-hander in the Yankees’ farm system and also was his pitching coach with the major-league club. 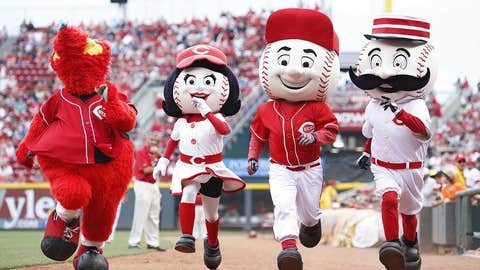 A definitive and highly scientific ranking of the real heroes of the diamond ... our beloved mascots.